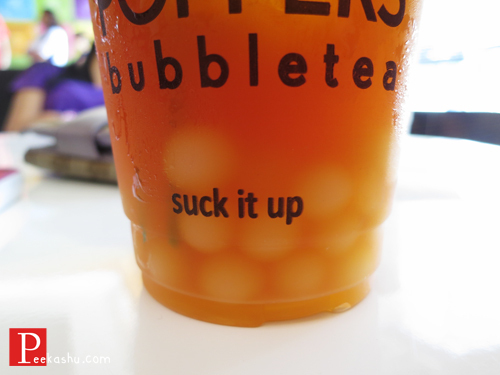 Poppers Bubble Tea. - Peekashu. 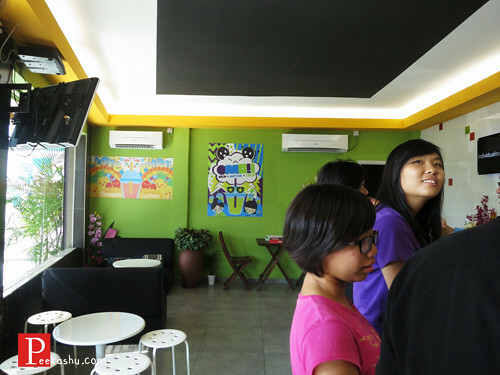 Back in high school, one of my favorite memory was queuing up for a cup of milk tea before tuition. Well ok thats not my memory. My memory was gobbling up all my best friend's pearls. It was such a popular drink but it was super unhealthy as it was made out of powdered colouring and flavours. 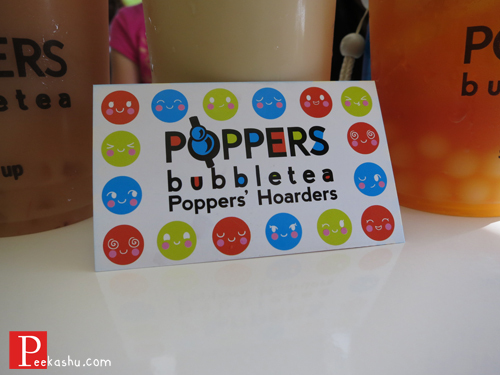 That was before Poppers Bubble Tea opened in Sitiawan. For weeks I saw people posting on Instagram about this new bubble tea place and it really spiked my craving. Which lead me to spend alot of 5AUDs on Chatime. The interior. Complete with aircond, TV and a really fun ambiance. I'm a very shallow person. I usually judge a book by its cover which is why I immediately liked Poppers. Look at all the posters la ! So colourful and pretty. Makes my day looking at these colours. Really creative bubble tea names. 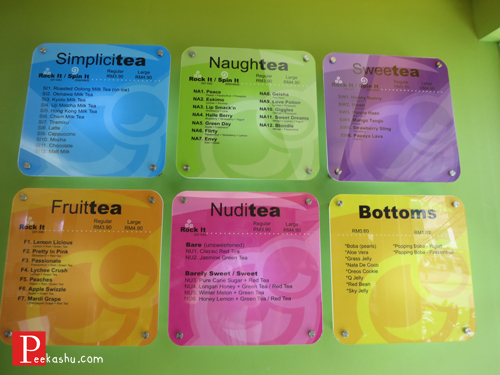 p/s I think Naughtea, Nuditea and Bottoms placed together sounds pretty wrong. Just saying. So anyway its pretty easy to understand. 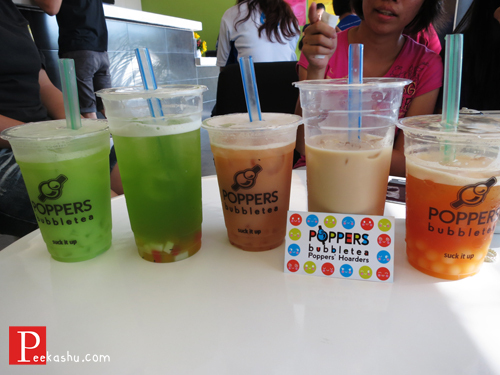 Simplicitea : Simpler milk teas like roasted oolong, okinawa, kyoto milk teas. Naughtea : Combination of fruits I've never imagined can be combined. Something different. Sweetea : Obviously the sweeter choices. Nuditea : Very tea-ish drinks. Great if you don't have a sweet tooth. 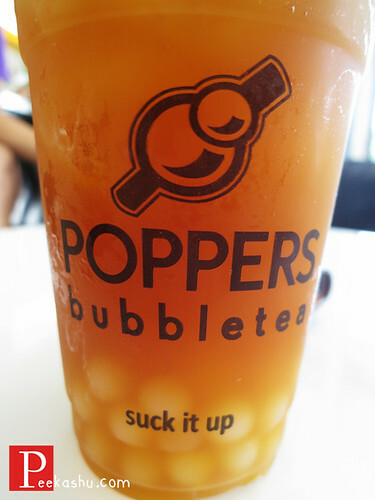 My favourite bottoms are the popping boba. I've tried both of them and both of them tastes amazing. Technically they're round bobas that has liquid in them and just pops in your mouth. 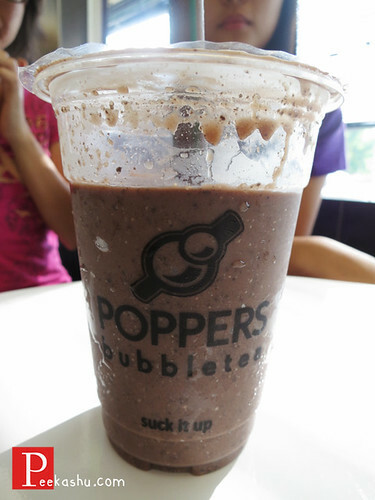 Aiya just try it la, I tell you also you cannot feel the mouthgasm unless you're damn pro in imagining popping bobas la. The prettiest name card. Another reason why you need to go get one. Apple Swizzle, Envy, forgot what, Roasted Oolong Milk Tea and Passionate. My first cup : Passionate. I love the taste of passion fruit + tea. Super refreshing. Sucking up all the popping bobas. Tried Lip Smack'n today (Strawberry + Lime) and got free pearl bottom from the boss ! Their pearls are the best honestly. 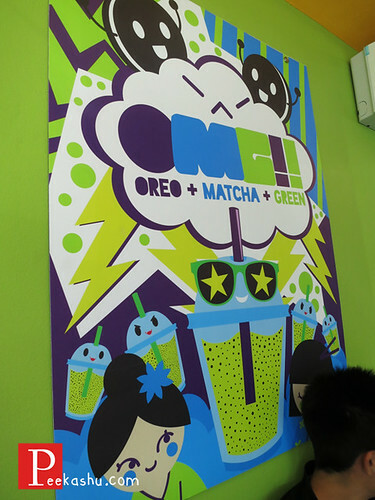 After having drank so much of Chatime in Melbourne, I can't help feeling regretful for all the money I've spent on it. I always hated Chatime's roasted oolong because it always has the chaoda taste and I almost threw away half a cup the last time I drank it. Heart pain cos so expensive :( but this time round, I tried Jen's roasted oolong and it was amazing. It tasted roasted but not overroasted if you get what I mean. and plus it only costs me RM4.90 for a regular sized Poppers bubbletea. After having Poppers, I'm never gonna spend that 5AUD on Chatime ever again. 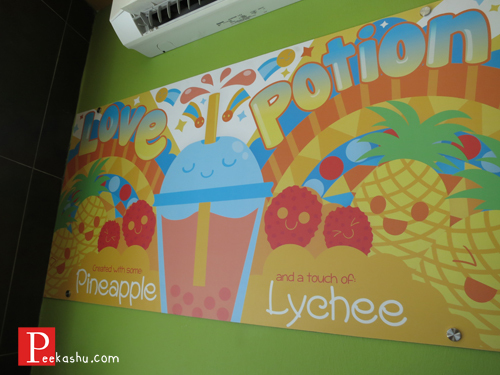 If you're in Sitiawan and you haven't tried it out yet, I hope you try it out after reading this ! It is so worth hopping into your car and driving all the way there just for a cup of drink. Directions : Located next to Petronas station opposite Kamdar.